From job site to backyard barbecue, this belt stands up to hard wear. This men's belt is made of waxed full-grain leather that's stiff and durable. The Carhartt logo is engraved on the metal keeper. We are sorry to hear this. Please contact us at 1-800-833-3118 if we can assist you further. the best you will ever buy. Great belt, made well I would recommend it. Excellent craftsmanship!!! Will last a lifetime!!! Looks good. You can see and feel the quality in it. I recommend it. This was a Christmas present for my husband. He is very happy with this belt. It is a good fit. And, as with other Carhartt products, he’s impressed with the quality and look of the belt. This is a really nice belt. It's durable and good quality. It looks really nice. It goes nicely in a casual setting, working, and in a somewhat formal setting as well. I have it in black. The brown looks sharp too though. Should have ordered a 38But all is good.It will encourage me to lose weight. Thanks! A quality product that I will highly recommend. My son loves this belt. It is all he had worn for years!! I have one of these in black and one in brown. They're great belts. When wore my brown one all day waist-deep in the York River, the dye rubbed off some where the belt was buckled, but that's probably my fault. I have had a lit of belts. This one in particular has been exceptional in comfort and durability. No sharp things that poke you while sitting. Thick leather they does not stretch too quickly and is still comfortable. Fits well strong good construction. Bought for my husband my birthday. He seemed very pleased with color and fit of the belt. Hopefully it last! I do agree on the going a size up from their pants size for a better fit. Bought a carhartt jean belt which had the same buckle but had a leather belt loop and husband loved it. This one has a metal belt loop and I need to return it and get one with the same buckle and a leather belt loop. Great fit and looks real good. I added this to my Carhartt work gear collection about 3 months ago and after wearing it 5 days a week during that span it's already beginning to show some wear near the hole that I use. I'm a huge advocate of Carhartt gear mainly because of their quality but this belt falls a bit short of the mark. We have reached out to the customer regarding their concerns. Thank you for your input. We apologize that these belts did not fit as expected. Please feel free to contact Customer Service at 1 800 833 3118 for assistance. So far it seems like a great belt. Heavy leather. It may run a bit small though. I am a 34" waist and ordered a 36" belt. I am using the very last hole in the belt. Good thing I didn't order the 34". Love everything else though. Takes a bit of wear to get it to soften up because the leather is so thick. I needed a heavy duty belt and this fit the bill. I am happy with the belt, seems to be good quality. I love my new belt. I've only worn it 3 or 4 times... and I hope it holds up. If it doesn't, I'll be sure to let ya know!!. A solid, dependable belt. No Fru Fru dress belt look. Nice belt. Looks and feels good. My new daily belt. This is the 4th jean belt that I have purchased. Great belt. Love the look. Needed different sizes as my waist increased and decreased over the last 10 years. Solid belt for the value. I love this belt, it has better spacing between the holes. Other belts are either too tight or I am constantly pulling up my pants, this belt is just right. Now I need to get a black one to go with my brown belt! I lost my last one, best belt I've ever had and at 80's that's saying something Thanks carhartt! It does the job kept buying crap just like my boots no more only shop here. Have it and the brown one as well they tough and that's what's up. Hope it holds up as well as the one it is replacing! Fits perfect. Looks good. Can't complain. I have been very pleased with the belts I have gotten from Carhartt. 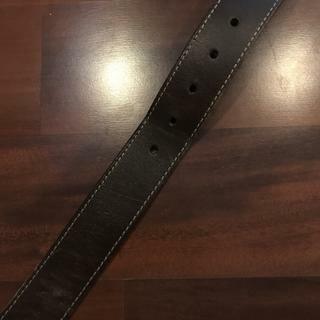 They are very durable, unlike some belts from other manufacturers that literally lasted only days before the holes ripped out and they became unusable. The only belt anyone will ever need. I ve been wearing the same carhartt belt for 15 yrs and still are wearing it. I bought a spare a few years ago thinking this belt was going to wear out. I still believe carhartt makes there products to last specially the USA brands. The day carhartt makes cheap products is when I go naked cuz I wont wear any other clothing.....ever!!!! I bought this exact belt 10, maybe 12 years ago. It was a very solid, quality belt. I'm a big guy and a carpenter and this belt lasted the test of time. Leather being what it is, over time the belt stretched out a little. This combined with the fact that I lost a couple of pounds meant that I needed a new belt. Without hesitation I went straight to the Carhartt website, ordered a new one and in less than a week it was at my front door. As soon as I took it out of the bag I could tell that it was not made with the same quality of materials that the original was made with. You can just touch the leather and buckle and tell that it's just not as good. I've only worn it a few times now and the front of the belt is starting to wrinkle a little bit. Don't get me wrong, for the price it's a pretty good belt, but I would gladly pay a few extra dollars for gear that's made with the better materials. All as advertised - fit, appearance, etc. I will update this regarding durability. I'm in an out of a truck all day, lifting, carrying, etc. All previous belts have lasted less than one year. This is the best belt I have ever owned. The fit is perfect and it seems like it will wear like iron. No marks on the belt where it latches like most cheaper belts. I would definitely recommend it to anyone who wants a nice looking belt that will last for ages. My husband says this is the best belt I've ever bought him. Very comfortable and durable. Is the belt made from one solid piece of full grain leather or is it a thin top layer glues to a cardboard substrate like other belts? BEST ANSWER: This will be a solid piece of leather. BEST ANSWER: Yes, the buckle is held by two snaps on the leather flap. Just unsnap them and you can remove the buckle and add another instead. But the snaps are secure, they won't come undone accidentally. I actually buy this belt every time in part because it is not interchangeable. It is firmly placed and there fore handles the abuse I give it better than other belts I've had. The buckle is stitched into the belt, so not unless you're a lot more determined than I am. how long is the 40 in belt not including the buckle? BEST ANSWER: It measures 40." is the belt made in USA? When will you be receiving more of the brown jean belt in size 36? 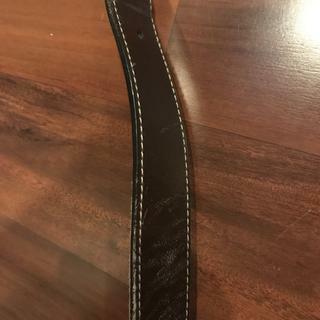 What is the belt's width? BEST ANSWER: This style is 1.5 inches wide. where can I find a replacement for my broken belt buckle for my brown jean belt? ?# stamped on belt buckle is 507331 or SO7331. BEST ANSWER: Please contact Customer Service for assistance. We can be reached M-F 8am-9pm EST and Saturday 9am-5pm EST at 1 800 833 3118. Is it possible to have Jean belt made in size 29 ? BEST ANSWER: Our Men's Jean Belt (A89) is offered in sizes 34-54. However, we offer a Boys Jean belt (4252) in the size XL which is recommended for a waist of 30-32. Belts come in even sizes than you adjust them to size using the holes in the belt, so if you are a size 29 than you would get a size 30 belt. How do I determine belt size? BEST ANSWER: We recommend adding 2 sizes to your waist size. Add two inches to waist size.